Caribbean pine is a keystone species (one that is essential for the diversity and organisation of an ecological community) in the species-rich pine forest ecosystem. It is the only pine native to the Bahamas and the Turks and Caicos Islands (TCI). Caribbean pine is the national tree of the TCI where, sadly, the majority of the trees has been killed in recent years by an introduced scale insect. The TCI is one of the UK Overseas Territories. Pinus caribaea var. bahamensis usually grows in small pockets of soil on limestone and can reach up to 25 m in height. Caribbean pine is adapted to survive natural fires that are essential for maintenance of this forest type. In the absence of fire, the undergrowth becomes overgrown and not enough light penetrates for pine seedlings to germinate. Caribbean pine provides shade, shelter and food for many other plants and animals. The Bahama parrot ( Amazona leucocephala bahamensis ) lives in these pine forests on Abaco and feeds on pine seeds. It is the only ground-nesting parrot in the Western hemisphere and the only one in the world adapted to live in an environment with frequent natural fires. Pinus caribaea is a tree up to 45 m tall with a single, erect trunk. It has rough, scaly, grey-brown, fire-resistant bark that breaks into squarish plates. Needles (leaves) are light or dark green, usually 15-26 cm long, and bundled into fascicles (groups) of 2 or 3 (rarely up to 5) needles. Male and female cones (reproductive structures) occur on the same tree. Pollen-bearing cones (males) are cylindrical, 2-3 cm × 5-6 mm and pink or yellow, turning yellowish or reddish-brown. Seed cones are mostly in pairs or whorls and borne on long peduncles (stalks). Female cones take two years to mature and release winged seeds that are dispersed by the wind. Pinus caribaea has been listed as of Least Concern (LC) at species level according to IUCN Red List criteria, but the varieties P. caribaea var. bahamensis and P. caribaea var. caribaea have been assessed as Vulnerable (VU). Large numbers of pine trees have been killed in the Turks and Caicos Islands (TCI) in recent years due to an infestation by an accidentally introduced exotic scale insect ( Toumeyella parvicornis ). In response to this threat, an ex-situ collection, a monitoring programme and an international pine recovery working group have been established through the TCI Caicos Pine Recovery Project. 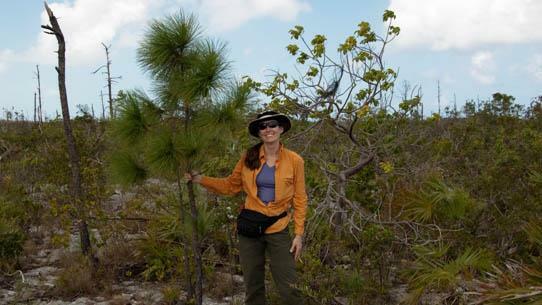 A Darwin Plus project awarded in 2014 'Caicos pine forests: mitigation for climate change and invasive species', with additional funds from the John Ellermann Foundation, will ensure the continuity of the project in TCI.The project hopes to conserve the Caribbean pine for the future and increase knowledge on pine ecology and species interactions. Kew's involvement in this international collaboration is led by Martin Hamilton, coordinator of Kew's UKOTs programme. 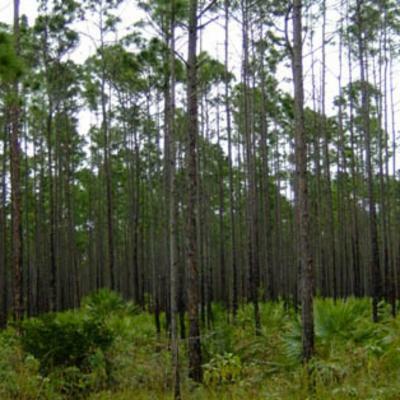 Other threats to Caribbean pine include hurricanes, clearing of vegetation for new building developments and uncontrolled fires started by people. Caribbean pine has been heavily exploited as a timber tree, particularly P. caribaea var. hondurensis , leading to its localised decline in some areas. Pinus caribaea var. bahamensis occurs in protected areas including the Abaco National Park on Abaco, the Lucayan National Park and Rand Nature Centre on Grand Bahama, the Blue Hole National Park and the West Side National Park on Andros, and the Conch Bar Caves National Park on Middle Caicos. Dr. Michele Sanchez, a member of the UKOTs team at Kew, researched the biogeography and genetics of the Caribbean pine in the Turks and Caicos Islands (TCI) and the Bahamas during her Ph.D. at Birkbeck, University of London; with help and support from other Kew colleagues and local partners Department of Environment and Maritime Affairs (DEMA) in TCI and the Bahamas National Trust in the Bahamas. 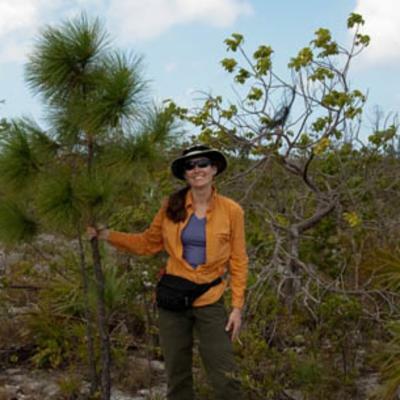 Michele has undertaken several field trips to Caribbean pine forests to collect samples for DNA study and data on the location and ecology of the forests and to record differences among pine trees. Maps produced showing the size and location of modern forests and tracking changes that have occurred since the 1960s have been shared with the Bahamas Forestry Department to aid planning and management of the pine forests in the region. The different patterns of pollen and seed dispersal detected indicate that pines in the Bahamas and TCI forests exchanged genes in the past, but as distance between forests increased they started differentiating genetically. Considering the genetic differences observed in nuclear DNA and also the political boundaries between countries it has been suggested that these forests are managed separately and exchange of pine trees between regions is avoided if possible. New research by Kew staff from the UKOTs team and Jodrell Laboratory is now being carried out in the TCI pine forests as part of the Darwin Plus project, with support and collaboration of local partner, DEMA. 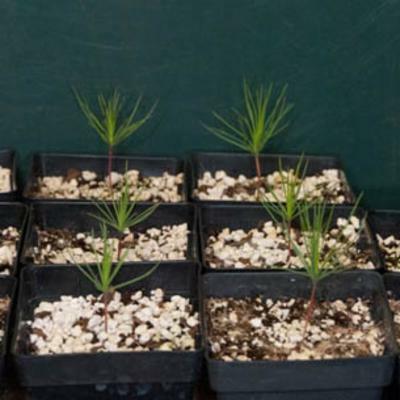 The research includes pine genetics, mycorrhizal fungi, water relations, pine population viability studies and chemical compounds in pines and their relations to pine health and susceptibility to pests. Protocols will be established to assist local partners in managing the pine forests for the future. Follow the UK Overseas Territories team blog and tweets for the latest project news, including work being carried out by Kew UKOTs staff, Jodrell Laboratory staff and partners. Caribbean pine is an important timber tree (particularly Pinus caribaea var. hondurensis ) and has been widely planted as such. The wood is heavily resinous and used for building, boat decks, crates, plywood and pulp manufacture. Caribbean pine trees have been widely tapped for resin in Honduras, although this use is now less common. Intensive logging, pulpwood and turpentine extraction and charcoal production occurred in the Bahamas during the first half of the 20th century. Wood is still extracted today for construction and boat-building but not on a commercial scale. There are 49 collections of Pinus caribaea seed held in Kew's Millennium Seed Bank based at Wakehurst in West Sussex. 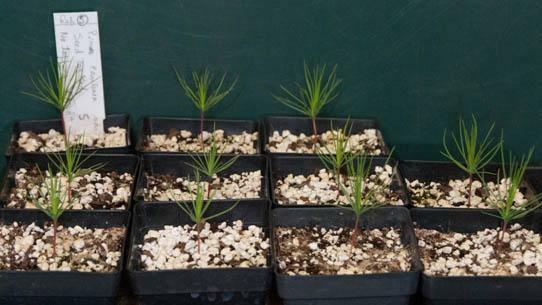 Germination trials using Caribbean pine seeds collected by partners in the Turks and Caicos Islands (TCI) and sent to Kew are currently taking place in the Quarantine House at Kew. After being cleaned with hydrogen peroxide (to minimise problems with damping-off fungus, which has been a problem in TCI), pine seeds were sown in a mixture of sand, perlite and Kew mix number three (a coir-based medium) and kept in a growing chamber, where they were regularly monitored. The first seedlings appeared eight days after sowing. When large enough, seedlings were potted-up and moved out of the chamber. Information obtained from this trial has been reported and shared with partners and a cultivation protocol is being written at the moment by Marcella Corcoran from the UKOTs team. Currently, there are 90 pine saplings growing at the Quarantine House at Kew waiting to be displayed in the gardens, used for research and shared with other institutions. Pressed and dried specimens of Pinus caribaea are held in Kew's Herbarium, where they are available to researchers by appointment. The details of some of these specimens can be seen online in Kew's Herbarium Catalogue. Specimens of the wood, cones, resin and fibre from Caribbean pine are held in Kew's Economic Botany Collection in the Sir Joseph Banks Building, where they are available to researchers by appointment. Least Concern (LC) according to IUCN Red List criteria, but some varieties assessed as Vulnerable (VU). Pinus caribaea is rated as Least Concerned (LC) according to IUCN Red List criteria and has received a EDGE score of -8.34, which places it in position 969 on the EDGE Gymnosperm list. It has a Evolutionary Distinctiveness of 4.8, ranked 825. More information on the EDGE Gymnosperm project here https://www.edgeofexistence.org. Bahamas, Belize, Cuba, Guatemala, Honduras, Mexico Southeast, Nicaragua, Turks-Caicos Is. Roux, J.P., Ryan, P.G., Milton, S.J. & Moloney, C.L. (1992). Vegetation and checklist of Inaccessible Island, central South Atlantic Ocean, with notes on Nightingale Island. Bothalia 22: 93-109. Sanchez M., Ingrouille M.J., Cowan R.S., Hamilton M.A., Fay M.F. (2014). Spatial structure and genetic diversity of natural populations of the Caribbean pine, Pinus caribaea var. bahamensis (Pinaceae), in the Bahaman archipelago. Botanical Journal of the Linnean Society 174: 359-383. Sanchez M., Hamilton M.A., Farjon A. (2013). Pinus caribaea var. bahamensis. In: IUCN 2013. IUCN Red List of Threatened Species. Version 2013.1. www.iucnredlist.org. (Downloaded 21 August 2013). Malumphy, C., Hamilton, M.A., Manco, B. N., Green, P. W., Sanchez, M. D., Corcoran, M. & Salamanca, E. (2012). Toumeyella parvicornis (Hemiptera: Coccidae), causing severe decline of Pinus caribaea var. bahamensis in the Turks and Caicos Islands. Florida Entomologist 95: 113–119. Sanchez M.(2012) Conservation genetics and biogeography of the Caribbean pine ( Pinus caribaea var. bahamensis) in the Bahaman archipelago. Unpublished D. Phil. Thesis, Birkbeck University of London. Farjon, A. (2010). A Handbook of the World’s Conifers, Volume 2. E.J. Brill, Leiden. The Plant List (2010). Pinus caribaea. The Bahamas National Trust (2008). Endangered Species of the Bahamas- Bahama Parrot. (Accessed 14 August 2011). Hamilton, M. A. (2007). 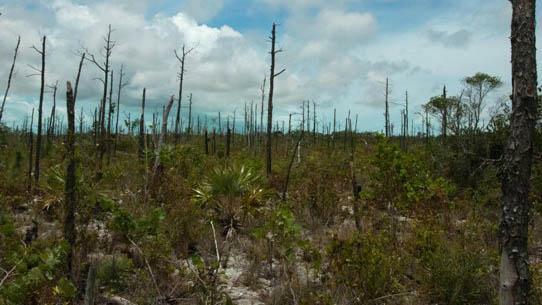 Turks and Caicos Islands invasive pine scale. In: Biodiversity That Matters: a Conference on Conservation in UK Overseas Territories and Other Small Island Communities (6-12 October 2006), ed. M. Pienkowski. UK Overseas Territories Conservation Forum. Myers, R., Wade, D. & Bergh, C. (2004). 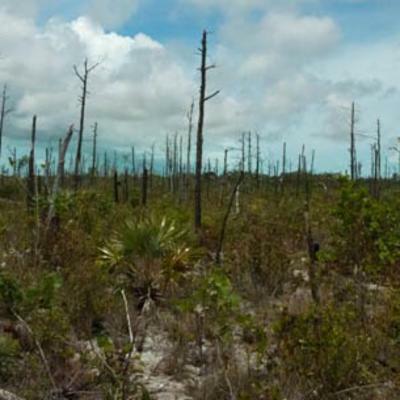 Fire management assessment of the Caribbean pine ( Pinus caribaea) forest ecosystems on Andros and Abaco Islands, Bahamas. The Nature Conservancy, Arlington, Virginia. Farjon, A. & Styles, B. T. (1997). Monograph of Pinus. Flora Neotropica 75: 85-91. Mills, L. S., Soule, M. E. & Doak, D. F. (1993). The keystone-species concept in ecology and conservation. BioScience 43: 219-224. March, E. W. (1949). 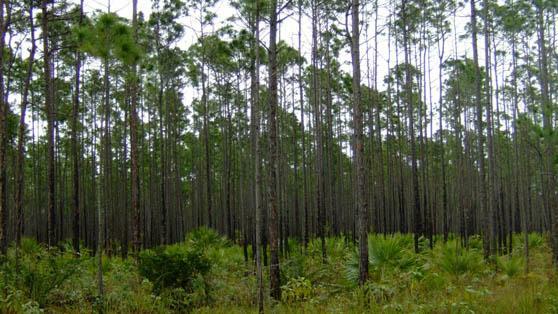 Pine forests of the Bahamas. Empire Forestry Research 28: 33-37.